Splendid Seniors reminds us that creativity, passion & influence can not only flower in later years, but bear delicious fruit. every required reading list. It contains a lot of things I'd forgotten, as well as many new and interesting facts about the selected 'senior achievers.' It makes me want to walk up to people and say 'Did you know....?' 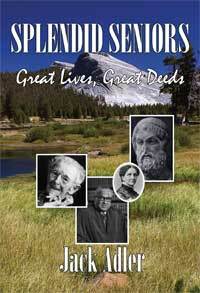 I found this book to be informative as well as delightful—a good gift for 'juniors' and 'seniors.' My Dad will be getting a copy for Father's Day!" involvement. Reading about Alexander Graham Bell, Mary Baker Eddy and Benjamin Disraeli, whose lives were rich with purpose in their later years, is an inspiration to all that it's never too late to pursue a passion. As Frank Lloyd Wright said, "The longer I live, the more beautiful life becomes."